Kololo is a perfect safari destination: malaria free, family friendly, cycling and hiking opportunities between the 'small' wild and excursions to the Big 5! Accommodation features upmarket villas and chalets, positioned in the pristine bushveld so privacy and relaxation is guaranteed. 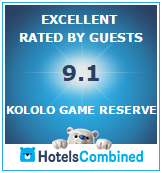 Wish to get a better idea about Kololo? View an extensive photo collection in our photo gallery. You can also view a short film about Kololo.